Winter does not always mean a blanket of snow is thrown across the garden. Some of us live in areas where snowfall is infrequent and melts quickly. And even if, like me, you do live in a place where deep snow seems inevitable by January and February, earlier in the winter— in November and December—shallow snow (or maybe even bare ground) is probably the norm. And this is when fleeting but delightful pictures are there for us to enjoy. 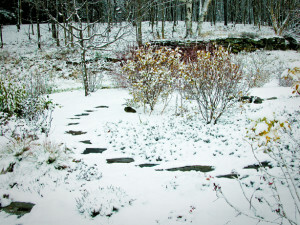 A dusting of snow on a frosty morning brings smaller garden details, things you may miss at other times of year, like this stepping stone path through the plantings behind our gazebo, into sharp relief. Consider yourself fortunate if you are blessed with an undulating property. Slopes offer so many opportunities, not available with a flat piece of land, for beautiful stonework. And these designs come alive in a little snow. Here is an example of how a set of stone steps, installed to help us get around in summer, also make a great winter feature. It all began some years back now. A massive rock outcropping, presumably left by a receding glacier back in the ice age, sits at the northwest corner of our house. The rock comes right up to the corner of the house— so there is no way to get past it there—and down in the basement it is actually visible, built right into the original stone foundation. It is a beautiful rock… people have often asked me if we had moved it into the garden. The answer is NO, that would have been a well-nigh impossible feat!! The rock was too steep to set steps directly on it, so our stone mason made a gravel build-out to reduce the angle of the slope. 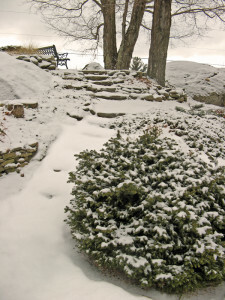 Then she set a dozen rustic stone steps into the gravel, to form a curving stairway. She also incorporated a flat landing in the middle to separate the overall run into two six-step sections. Finally she built a low retaining wall around the base of the rock to create a usable planting space. In summer, although the whole scene is delightful, the wall nearly disappears among the plants. But with the leaves and flowers gone, all it takes is a light snow to highlight the simple elegance of the entire design. In the summer, with all the flowers and colors vying for our attention, patterns created with interesting and contrasting textures often go unnoticed. But they reveal themselves in the snow. 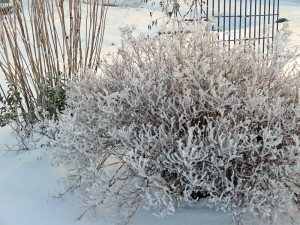 Petite shrubs, such as spireas, (Spirea japonica and Spirea alpina), as well as herbs and heathers, have mounded shapes and finely-divided twigs, with a delicate, almost lacy, texture that catches and holds the snow. 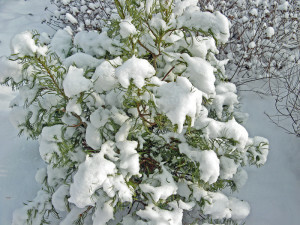 As with bigger shrubs, a solitary shrub looks plain lonely in an expanse of snow, so plant your shrubs with friends. In this picture on the left I have combined a group of three Spirea alpina with a dwarf evergreen, False Cypress (which the label said was actually a sport of the taller-growing Chamaecyparis pisifera ‘Boulevard‘). This is a Bush Cinquefoil (Potentilla fruticosa), next to the skeleton of a tall rudbeckia. Cinquefoil has the finest texture of any plant in my garden and, although it is a somewhat boring shrub in summer, it certainly comes into its own in winter. 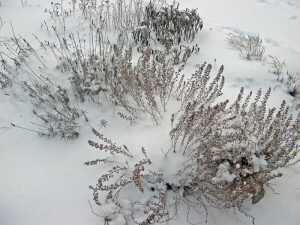 And finally in the winter garden, perennial herbs, like lavender, savory and sage, which are really classified as sub-shrubs, essentially behave like dwarf shrubs. All winter long they come and go as the snow pulls back and then re-covers them again. Then, next spring I will cut them back almost to the base to promote a new flush of growth for the coming season. Again it it the contrasts in texture in the snow that I enjoy. It goes without saying that evergreens are going to be a big part of the winter garden. However we know that a full sized evergreen, such as a hemlock or spruce, will eventually grow to become an 80 foot giant. Its size, combined with its dense dark coloration, makes an imposing presence in the forest. 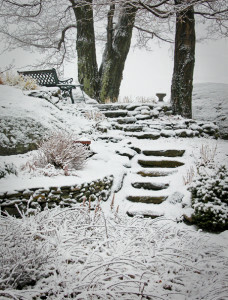 But in the garden landscape, even when carefully situated, it can feel overbearing and almost gloomy in winter. And everyone has seen examples of evergreen ‘foundation plantings’ that have been allowed to grow up to cover the windows so that all light is blocked from the rooms. So it is important to choose carefully and site wisely. Personally, when it comes to small spaces, I far prefer the slower growing evergreen cultivars; they give a ‘green look’ to the winter garden but, even after many years, they should remain in scale with their surroundings. Up here in snow country I also like to plant them away from the house, in part so the snow falling from the roof does not pile up and break the branches, but also so they can be enjoyed from indoors in winter. 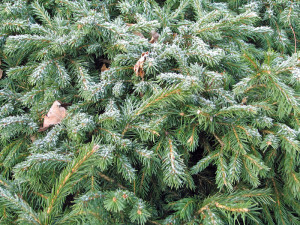 When it comes to evergreens, there are many choices of cultivars available, so it pays to go to a good nursery that can offer guidance. The various cultivars exhibit different growing characteristics …the form…as well as different rates of growth. A cultivar with a central leader will typically become a pyramid, and through the years it will keep growing upwards, (although much more slowly than the species) to make a lovely focal point for the winter garden. However before making a final decision about what and where to plant an upright cultivar, check the estimated yearly growth and calculate how tall it will be after ten and twenty years. If it is going to get too tall for the spot you have in mind, then choose an outward growing cultivar without a central leader. Here is a mounding dwarf Norway Spruce, Picea abies, (the tag has long since gone, but it is probably P. a. ‘Pumila’) which I also can see from my study window. It marks the bend in the path as you walk up the steps over the rock. 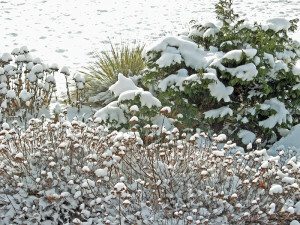 It has been growing here for more than ten years, and is now about three feet high and more than four feet across, large enough to look great in the snow.